Over the weekend the weather was very nice for March. So I visited a Lexington Limestone site with two friends and collected Ordovician Period fossils. Here is one of my rare finds of a fossil plate of a carpoid called Enoploura. 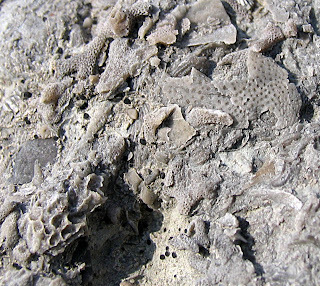 Fossil found in Franklin County, Kentucky. Also view this November 22, 2009 blog entry of a larger section of Enoploura found.